Former Arkansas player Darrell Brown, who might have been the first African-American to play in the South, has died. 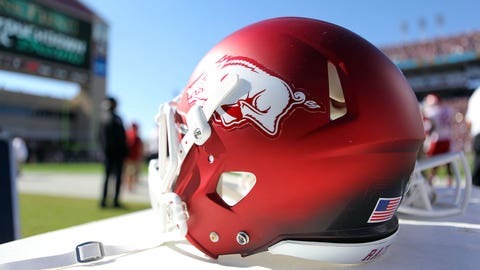 Darrell Brown, a trailblazer at the University of Arkansas and perhaps the first African-American player to break the color barrier in football in the South, has died, according to Yahoo Sports columnist Dan Wetzel. Wetzel reported the news in a post on Facebook. Brown was a walk-on for the defending national champion, all-white Razorbacks team in 1965 under head coach Frank Broyles. Despite relentless opposition from within the program and efforts from coaches to run him off, Brown persevered. He never played in a varsity game for the Razorbacks, but he will forever be remembered as a pioneer. Wetzel says Brown "in all likelihood" broke the color barrier because only a few people actually knew his story until about a decade ago. According to a 2002 Associated Press article, it wasn’t until three years after Brown walked on that Arkansas recruited and signed an African-American player, Jon Richardson.